What a difference a year makes. This time last year, Tusk to Tail was preparing for the Hogs’ first game to be played in Little Rock at War Memorial Stadium, in what many speculated might be the last game ever there for the Razorbacks. To make matters worse, the remains of Hurricane Harvey were spiraling into Central Arkansas promising a wet, windy tailgate and nasty game. In many ways, that same forecast loomed over the Razorback Football team’s season like a pork chop around a fat kid’s neck. Most fans knew it was a make-or break year for this staff. Everyone, that is, except for Jeff Long. There was a lot of preseason grumbling. The fans were not showing up for the same old same old, and this team had better win. Well, we all know how it went from there. The Hogs lost more than they won, the kick-off times became earlier and earlier, and the fans stopped putting butts in the seats. Jeff Long was fired for not firing Bret Bielema, and then Bielema was fired promptly after the Missouri loss in Fayetteville for not doing his job. Now we as Hog Fans have a bright new shiny North End zone, a new likeable Athletic Director and a new head football coach who promises a scheme that should get this team back to wining more often than not. AD Hunter Yurachek and Coach Chad Morris seem too good to be true at the moment, and I think most realistic fans know 2018 could be a struggle for Coach Morris this season. The Hogs have an O-line that is learning on the job, and there is no real experience at QB. However, there are some bright spots. The defense is talented with some play makers. The running backs, tight ends and the wide receivers have some good players. We aren’t real sure who will be the play makers at any of those positions just yet, but the schedule sets up for this team to find some wins. There may even be enough wins for a bowl game if things go the way of the Hogs down the stretch. 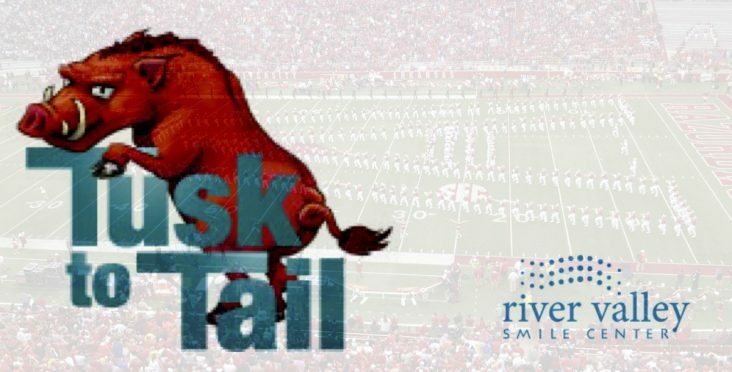 As always, Tusk to Tail will be there to bring you the details from the parking lots to the stands. We have some great road trips lined up this season, including Fort Collins, Colo.; Auburn; Dallas; Starkville; and Columbia, Mo. The planning for some of these trips started last Fall with hotel reservations, and continued through the summer with dinner plans and reserved tailgating spots. As for game one this week, the Eastern Illinois Panthers are the opponent. Please remember the 3 p.m. start time is going to have most fans arriving on campus around 11 a.m. to noon. If you plan to tailgate, go early and avoid the 4-hour traffic cut-off rule. All streets around the stadium are closed or become one-way long before game time. Shoot for a 10:30 a.m. arrival and avoid that hassle. Also, ladies, please remember the clear bag policy put into effect last season, so no purses that are not clear. Brad Davis has returned to our tailgate this season to cook up more great food for us. We could not find much to pair with an Eastern Illinois Panther so we decided on some classic Yankee comfort food in Bratwursts and Philly Style Cheesesteak Sandwiches. The weather forecast doesn’t look too bad for a Sept. 1 kick-off date. It will be warm with an occasional chance for a rain shower. To mitigate the heat, we will have some fans on hand to move air around the tent. Speaking of tents, we have a larger one this year. The past six years we have had 600 square feet of tent space. This year, we bumped that on up to 800 square feet. The highway department removed some trees for the widening of Maple Street in front of Razorback Stadium, so we felt it best to get a little more shade and elbow room for our guests under the tent. I always try to add some helpful recipes, drink ideas and tailgating tips in this column for all of you and this season will be no different. I start the week with multiple lists. There is a headcount list which provides an idea on how much food will be needed. A food/beverage purchase list is divided between Sam’s, the grocery store and the liquor store. Finally, I make a packing list for everything I’ve purchased and all of the necessary gear. I actually have these lists for home and road games, as the requirements are different for each, but that is just me. That may be overkill for the casual tailgater. With these lists and the basic tailgate List below, you should be in good shape for every game, and prepared for just about any eventuality. To get started here is a basic list of items you should review and have in your kit before you head out this Saturday. Emergency Kit to include Pain reliever, Pepto-Bismol, Chapstick, sun screen, feminine products, camping toilet paper, wet wipes, Band Aids, Tide to-go pen, etc.